Far too often, we fear that there is not enough room for all of us powerhouse women at the top. So, we turn on each other. Women can be competitive and still be supportive. In fact, we can lift each other up as we climb that ladder together. This is something that, perhaps, millennial women are better at. They grew up with social media so they know how to access knowledge and are more accustomed to asking for help. They work together and leverage their relationships to become the thought leaders they want to be. One of the people helping them do this is Rachel Brownlow Lund. 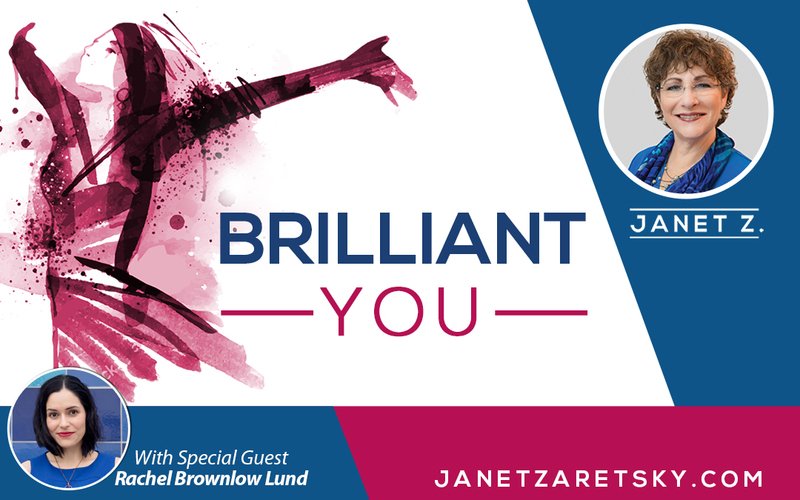 I’m proud to be a mentor to her and thrilled to have her as a guest on this episode of the Brilliant You Podcast. Rachel is a coach, speaker and community leader working specifically with ambitious millennial women. In our conversation, we discuss how this generation of entrepreneurial women differs from others but discover that there are plenty of similarities too. She shares with us the strategies she uses with her clients to help them deal with self-doubt, perfectionism, and the comparison trap. And, how she herself went from being deeply introverted to being a networker and connector. Hint, it involves something you hear me say all the time – get comfortable with being uncomfortable! We also discuss how to deal with jealousy in moments of success and how to avoid ‘comparisonitis’ as you chase after your goals. Plus we chat about how you can benefit greatly by helping others along the way. Rachel’s final advice (and challenge to you) is to put some focus on self-care. For her, that means finding a happy medium between being ON and being completely OFF. She shares one interesting suggestion that involves walking and writing. Finding time to help and uplift others is also a part of the self-care equation. And, the connections you make doing this will help you feel more supported and inspired as you strive toward your goals. Regardless of the generation, you count yourself in, if you’re a powerhouse business women (or one in the making), this episode will help you build and leverage a supportive tribe which will ultimately make getting to the top a lot more fulfilling.